Overworked and underpaid? Doing more than your fair share at home? No one values your contribution? Wish someone simply appreciated you? If you are feeling unappreciated, you aren’t alone. If you want to get unstuck I have an unconventional and counter-intuitive cure for what ails you; focus on someone else. It sounds crazy, in fact your friends probably told you to stand up to your boss and ask for a raise. Your best friend likely told you to stop doing the laundry until someone notices. Your therapist probably told you to read “Codependent No More”, and your family probably thinks you should change jobs. I know from personal experience that the cure for ingratitude is gratitude. Since all of that stuff hasn’t been working out for you I’m going to suggest a radical notion. Try this crazy idea whether you believe it will work or not and see what happens. You really have nothing to lose. A real thank you note—on paper—in your handwriting sent via snail mail. I believe wholeheartedly in the power of thank you notes. If you want a simple way to change your life, your work, your relationships, your business, or your personal happiness then this is it. 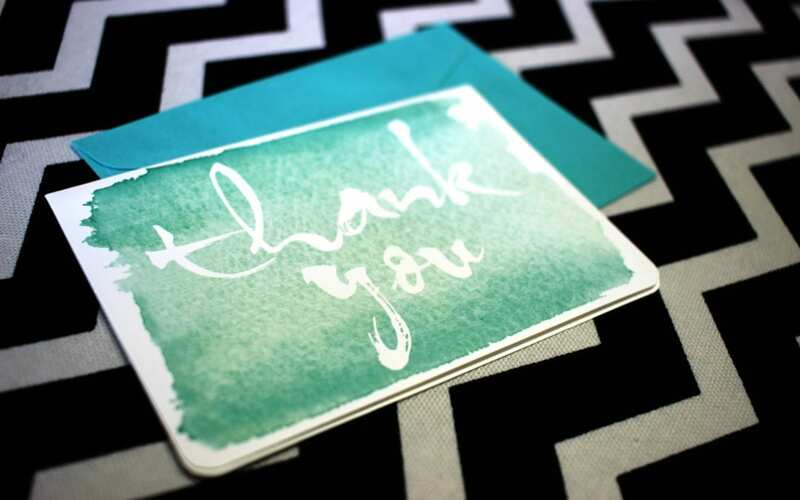 I first learned the amazing benefits of thank you notes at an unlikely time for me to feel grateful. I had a really bad year where I lost my job, my home, and my husband in a span of six months. Life crashed in around me, and I had to take whatever work I could get. I ended up taking a job as a commissioned sales person in a furniture store. My boss was a jerk, my co-workers routinely sexually harassed me, and I worked long hours. On top of that there were many days that I didn’t make a single sale, which added to the discouragement. Needless to say, I often found myself feeling unappreciated. As is the case in many commission jobs, we were required to write a thank you note to every customer who purchased something from us. At first it was just a task. In time though, I really started to feel grateful. The more notes I wrote, the more grateful I became. I became so truly happy in my work that it carried over into my life. I started writing thank you notes to customers that didn’t buy anything. I wrote thank you notes to people outside of work. There was a wonderful payoff, I started selling a lot of furniture. I’m not sure if it was because people appreciated the notes or because I was more joyful, less stressed and ultimately a better employee when I was grounded in gratitude. What I do know is that it worked. I learned it worked best when I started my day writing thank you notes for the previous day’s sales. It set my frame of mind for the whole day. None of the bad things about the job changed, the only thing that changed was me, which of course is the only corner of the universe we ever can truly change anyway. I carried this habit with me through the next few for-profit gigs that I worked before finally returning to my first love: the arts. Any time things got too hard or too stressful I’d eventually realize I’d gotten out of the thank you habit. Once I started my day with gratitude again everything would turn around. I know that everyone at times feels overworked and underpaid, most of us have times where we feel unappreciated or under-appreciated for our contributions. Never have I experienced the discouragement of that more than when working in a non-profit. And, I know I’m not alone. I’m sure that is part of the reason for high burn-out and turnover in the non-profit world. Non-profit workers are always paid far less than their private sector pals whilst having a greater feeling of passion and personal investment. Interestingly, I let the thank-you habit slip for a year and it’s amazing how hard my work became. I sat down and wrote over 30 thank you notes to people involved with my organization. First I wrote the easy ones, the ones to people who are always positive and helpful. Then I proceeded down the list until I got to my most mean spirited critic. I stared at that blank note for a good long while. I thought about all the reasons I was hurt and angry, but I wouldn’t let myself get up until I could push that aside and find my gratitude. In time I was able to think of 3 things I truly appreciated about that person and I wrote the note. The transformation was incredible. My heart had changed. I realized that I had real loving and appreciative thoughts about every person in my immediate sphere. Almost instantly all my hurt, anger and anxiety were gone. Not one person other than me had changed and yet I no longer felt taken advantage of or undervalued. In time that energy spilled over into some positive and unexpected shifts in our situation. A major donation that was critical to operations was pledged, several people from outside my organization made a point to thank me for my service and I was able to sleep at night. And it turns out there is science to support this. The practice of expressing gratitude changes our outlook, our behavior, and in the end the way that others perceive us. But Writing Thank-You Notes is So Hard! I Don’t Know What to Say? I used to hate writing thank-you notes, and really it wasn’t for lack of gratitude, I just didn’t know what to say. Once I said, “Dear Aunt Margaret, Thank-you for the lovely sweater,” I really didn’t know what else to say and I still had several square inches of dreaded white space staring at me. Then I learned that the trick is to end with the thanks, not start there. Here is my easy 4-step authentic thank-you. It works for all occasions. Business, personal, someone you know well, a relative stranger. It’s 100% NO fail! What did they do that was kind? They thought of you? They came to your party? They took time for a meeting? What did they give you or do for you? How will you use it or will the contribution be applied in your life/work? Every time I ______________ I will think of you. What good will this do for you? How are you better for what they did for you? You’ll notice that in both examples I embellished a bit and that is always great. Creativity is always a good thing, but stick to the format. There is a real psychology to the process. It helps facilitate authentic gratitude that impacts your thinking and has an impact on the recipient. If you consciously focus on thanking others your whole world can and will change. Tracy loves people, small businesses, and the local movement. She’s passionate about seeing other people succeed, which is why she splits her time between her marketing agency, Graziani Multimedia, and her startup, Tog Loft. She’s also a mom, wife, daughter, friend, artist, writer, and doer of impossible things. She believes in infinite possibility, so look out, she’s dangerous.